Danish physician; born in Amsterdam Sept. 4, 1727; died in Copenhagen June, 1800. 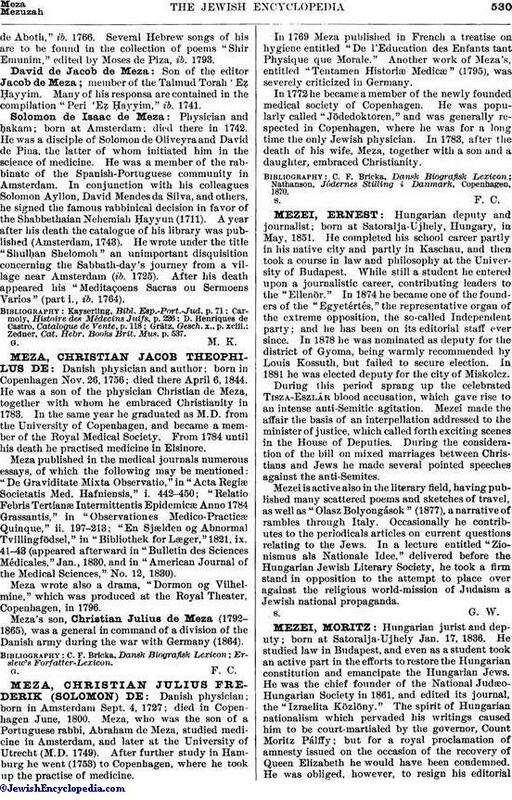 Meza, who was the son of a Portuguese rabbi, Abraham de Meza, studied medicine in Amsterdam, and later at the University of Utrecht (M.D. 1749). After further study in Hamburg he went (1753) to Copenhagen, where he took up the practise of medicine. In 1769 Meza published in French a treatise on hygiene entitled "De l'Education des Enfants tant Physique que Morale." Another work of Meza's, entitled "Tentamen Historiæ Medicæ" (1795), was severely criticized in Germany. In 1772 he became a member of the newly founded medical society of Copenhagen. He was popularly called "Jödedoktoren," and was generally respected in Copenhagen, where he was for a long time the only Jewish physician. In 1783, after the death of his wife, Meza, together with a son and a daughter, embraced Christianity. Nathanson, Jódernes Stilling i Danmark, Copenhagen, 1870.